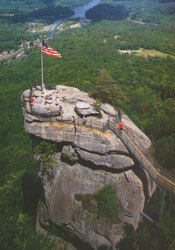 Asheville NC offers a wide variety of activities for all levels of outdoor enthusiasts. Named by National Geographic Adventure Magazine as one of the Ten Great Adventure Towns, there is something for everyone here. Asheville has also been named #3 of the Top Ten Up-and-Coming Travel Destinations for 2007 by VirtualTourist and was #5 on Frommer’s Top Ten Travel Destinations for 2007 as well. Asheville was also featured on the cover of the August 2007 Outside Magazine and is in their Top 30 Best Towns in America that are Fit, Fun, and Packed with Adventure. The Blue Ridge Mountains are the main reason that our area offers such a wide range of activities. There are approximately 300 miles of the famed Appalachian Trail in North Carolina, and we have multiple rivers, including the French Broad and the Nantahala, which offer rafting, kayaking and canoeing, depending on your taste. Pisgah National Forest offers endless opportunities for rock climbing, mountain biking, and trail running. The Blue Ridge Parkway also gives unparalleled access to trails, waterfalls, camping, and spectacular mountain views. If flat water is more your taste, we have some beautiful lakes in the region as well. Lake Lure is a popular spot to either live or vacation, boasts exceptional scenery, and also gained fame as the location for the movies Dirty Dancing and Last of the Mohicans. It is located within Chimney Rock Park, where hikers can enjoy 75-mile views of the Blue Ridge Mountains and the 404-foot Hickory Nut Falls, in addition to comfortable inns and quaint stores and restaurants.